I perfectly saw the English coast in front of the French portion of land known as Cap Gris Nez and in the middle a strip of water shining as a mirror under the morning sunrise. I could not stop staring; I was absorbed, captivated, almost hypnotized. The stewardess approached me offering a cup coffee. When she noticed that I did not answer, she touched my shoulder and asked: “Are you feeling all right?” Did I feel all right? Can someone who has been dreaming about something for the last year feel all right? Considering that such dream suddenly appears before you eyes, so tangible, so real, almost like magic. Of course not! I did not feel all right; I felt outside myself, there were a lot of expectations towards that strip of water. For the last 10 months I thought of the English Channel on a daily basis, and, in that moment, I had it before my eyes. 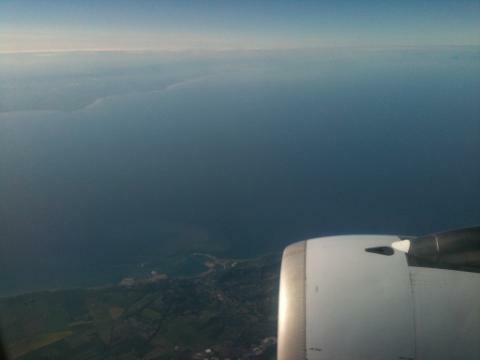 For a moment, the English Channel “intentionally” posed for me, I was able to contemplate it, analyze it, examine it. It introduced itself with its best face, full of sunrays reflecting on the water. Seemed like it did not want to hide anything; it was simply there, posing for me, letting me appreciate it as a whole from up above. With this image imprinted in my mind, I got off the airplane. i am satisfied to convey that I’ve a very excellent uncanny feeling I discovered exactly what I needed. I most no doubt will make sure to don?t put out of your mind this website and provides it a look on a constant basis. We’re a bunch of volunteers and starting a brand new scheme in our community. Your site provided us with helpful info to work on. You have performed a formidable job and our entire group will probably be grateful to you. Thanks!! I hope you enjoy the info and articles!! Thanks for you visit! This will be the suitable blog for everyone who wants to find out about this topic. You realize so a lot its practically difficult to argue with you (not that I truly would want?-HaHa). You undoubtedly put a brand new spin on a subject thats been written about for years. Superb stuff, just good! Thanks!!!! I hope you enjoy what Im writing. Im working very hard on the translation of my book, Días Azules…swimming the English Channel, as soon as I have it ready I will let you know. Thanks for the thumb up!! An impressive share, I just given this onto a colleague who was doing a little analysis on this. And he in reality purchased me breakfast mainly because I discovered it for him.. smile. So let me reword that: Thnx for the treat! But yeah Thnkx for spending the time to talk about this, I feel strongly about it and adore reading extra on this subject. If possible, as you turn out to be expertise, would you mind updating your blog with much more details? It can be highly beneficial for me. Major thumb up for this blog post! Hi Christian: Thanks!!!! I hope you enjoy what Im writing. Im working very hard on the translation of my book, Días Azules…as soon as I have it ready I will let you know. Thanks!!! I enjoy writing and sharing my swimming adventures. Thanks for telling me you like it! Keep in touch! I was pretty pleased to come across this web-site.I wanted to thanks for your time for this superb read!! I absolutely enjoying every small bit of it and I have you bookmarked to have a look at new stuff you weblog post.